This week on the podcast, Andy and I once more wade fully clothed into the in-ground pool that is Breaking Bad. 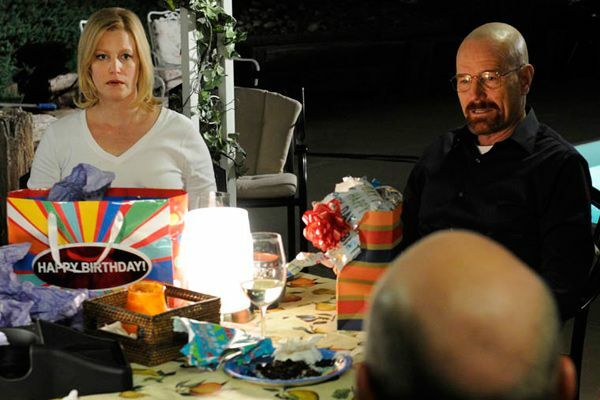 We address the anvil-on-the-chest charm of Walter and Skyler White’s domestic life, with a special segment dedicated to their aversion to turning on lamps. Has Walter White become too evil? And does that matter? Also, can we get a show that’s just Mike, Lydia, and Jesse eating at a diner? We then move on to lighter fare to discuss one of the few premiering shows this summer, NBC’s new Matthew Perry vehicle, Go On. Somehow we go off on a tangent about accordion-friendly 1980s stand-up comic Judy Tenuta. Don’t ask. Things jump up a notch when Andy and I discuss a shared passion: the films of Colin Farrell. Total Recall may have bricked, but that doesn’t stop us from singing the praises of In Bruges and revisiting just how much we wanted Miami Vice to be a thing. We wrap up the pod with a quick chat about the Olympics and spoilers, make a stop at the Double Down Book Club to talk about the Northern England noir of David Peace, and close it all out with a discussion of summer jams with Rembert Browne. Come on in. The water is fine.